Like Lake Amistad along the Rio Grande, 510 miles to the south near Del Rio, Lake Meredith is a large reservoir that provides many recreational opportunities and is managed by the National Park Service as a national recreation area, as well as supplying drinking water for 11 Texas cities including Lubbock and Amarillo. The lake filled in 1965 after completion of Sanford Dam across the Canadian River, 1/3 of the way from its source in the Rocky Mountains of northeast New Mexico to the junction with the Arkansas River in Oklahoma. Lake Meredith is an unexpected site in this part of Texas, 40 miles north of Amarillo, as for many miles in most directions the land is flat, grassy prairie without much water, crossed only by shallow, meandering, seasonal streams; the Canadian is the only major river and has eroded deeper valleys, up to 250 feet, and flooding of a 10 mile section east of the small town of Fritch has created the lake, which has around 100 miles of shoreline though this varies depending on the amount of water contained. The reservoir is quite scenic, a good place for boating, fishing, scuba diving, picnicking and swimming. Admission is free and several places have primitive campgrounds, again with no charge. Just south of the lake, on the east side of the river, is the adjacent Alibates Flint Quarries National Monument, which can be visited on a ranger-led guided tour. Main roads leading to Lake Meredith are TX 136 from Amarillo, FM 1913 from the west and TX 152 near the north end. Highway US 87/287 crosses the Canadian River just south of the recreation area, where a side road leads to the Rosita ORV area. 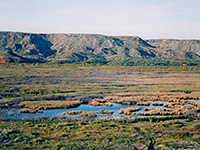 The preserve contains 10 miles of the river of which less than half has a lake, as for the remainder the waters flow gently through a wide grassy valley enclosed by low mesas formed of red and white limestone rock, split by several tributary creeks. 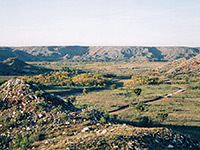 On the east side are two back country campsites - Mullinaw Creek and McBride Canyon, linked to TX 136 by mostly paved roads; only the last part is unpaved but in good condition. The approach is across open, bushy land though the canyons contain large cottonwood trees, willows and other vegetation, bordered by the steep mesa slopes that are strewn with colorful boulders. The sites are clean, not often used and the place has a distinct feeling of remoteness. There is not that much to do, however, and in summer the area is likely to be infested with mosquitoes. The west side of the NRA also has a small camping area, at Plum Creek, and a boat launch site, in case the waters ever rise significantly and cause the lake to back up this far upstream. Recreation sites further north are more popular since they overlook the lake itself. There are 3 main locations, all on the east side. 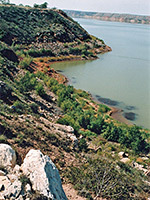 Harbor Bay, just west of Fritch, has a boat launch and campsite as does Fritch Fortress just to the north, plus a picnic area with drinking water, built on a high promontory overlooking the waters. North of this, Cedar Canyon/Sanford is the location of a marina together with various other facilities; houseboats, ski boats and deck cruisers are all available for rent. All the shoreline is formed by steep slopes, and although the water's edge is dotted by nice sandy beaches, it isn't easy to climb down, and most roads are to overlooks, not to the lake itself. Swimming is only officially recommended at a small lake just below Sanford Dam (Spring Canyon), a place that can still be dangerous as witnessed by a drowning here in June 2007. Overall, the lake looks nice, providing a striking contrast between the calm blue water, the steep, red/white rocky slopes and the flat green mesa tops, though non water-based activities are somewhat limited, with no recognized hiking trails.